A new book from Noro is out and it is worth taking a look at it. 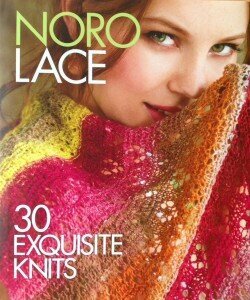 I love Noro yarns and I love lace, so when I received this book I couldn’t wait to look at all of the gorgeous and colorful designs. There is really something for everyone in this book. 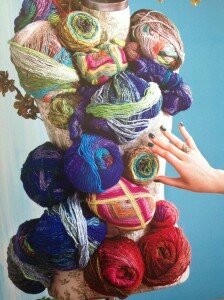 The photography showcases well the rich colors of the Noro yarns as well as the intricacies of the lace patterns. 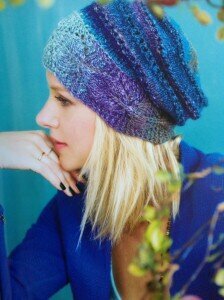 There are 30 designs in the Noro Lace book, including wonderful transitional pieces for this time of year. I especially liked these capelets, which can be worn casually with jeans or dressed up for an elegant night out. Many of the projects are smaller and knit up more quickly in case you are looking for a project that provides near instant gratification. The lace hat and mitts are fun and would make great gifts as well. The patterns appear well-written throughout the book. Some patterns are written out, without charts. Others are charted as well as providing written instructions. Using lace patterns with the Noro yarn highlights the transitions of color as well as the subtle textures created by the lace stitches. There is beauty in showcasing the texture of the yarn and stitches with a simple but rich solid color as well. As I said, there is something for everyone in this book. 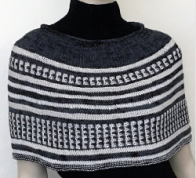 The designs feel modern, very wearable for knitters of all ages and sizes. 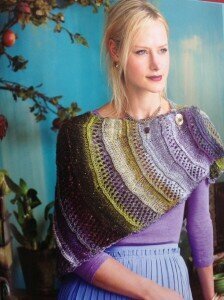 I hope this peek into Noro Lace motivates you to try a new knitting project? I will be adding several of these wonderful projects to my queue. Leave your comment here and your name will be included in the drawing for a free copy.